Her name is Cocoa! She is 20-something ounces, 3.5 feet long, with black eyes and a trim figure. I am fostering her until either someone adopts her, or I decide I want her. 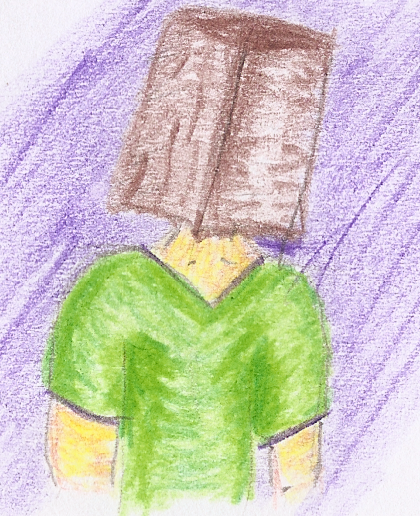 Let's welcome Cocoa like Beavis does! By peering intently down into the tank and occasionally rolling over. Uh oh! I predict one less cat in the apartment soon. "Hey! watch what cocoa here does with her new squeeze doll!" or I decide I want her. This deal's getting WORSE AND WORSE. Let's welcome Cocoa like Beavis does! By peering intently down into the tank and occasionally rolling over. It smells like ham in here. The snake was out and about at around 1:00am last night. It was flicking its tongue and trying to work its way out of the cage. It started spitting venom, or spit, but I'll go with venom ALL OVER THE PLACE. Ice Cream Jonsey wrote: The snake was out and about at around 1:00am last night. Yeah, there are special weighted clamps you're supposed to buy for a snake's cage. I see you're using scotch tape. This is an accident waiting to happen. Either the snake is going to bite/kill the cat, or the cat is going to kill the snake. Just throw it off of an expressway overpass into an open truck full of migrant farm workers and be done with it. It's not scotch tape, it's clear threaded (wtf do you call it?) packing tape. Also, the cage top is strong. Where Cocoa was before, there were 3 cats, any one of which weigh as much as any 2 of mine, and they sat on it ok. Beavis vs. snake? The snake could take her, easy. 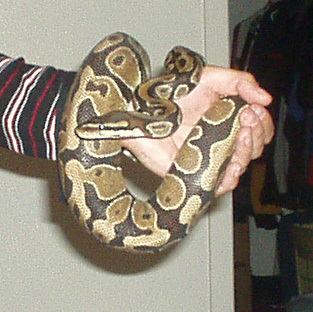 She is a ball python, and can constrict. Cocoa has not moved all day. I didn't think it was possible that any animal could be lazier than the current denizens of L201, but I stand corrected. Vitriola wrote: It's not scotch tape, it's clear threaded (wtf do you call it?) packing tape. Also, the cage top is strong. I don't get it. Did ICJ not say that the snake tried to get out and got out enough to spit all over the place, or does he mean "the cage" by "the place"? If you're really so eager to avoid buying the correct things to secure the cage you could at least put a book or something on it. 1) It didn't get out. 3) It doesn't shoot acid. 3) The walls are not melting like in a generic Dali painting. Worm wrote: If you're really so eager to avoid buying the correct things to secure the cage you could at least put a book or something on it. It and it's home came from the REPTILE HUMANE SOCIETY. THEY KNOW WHAT THEY'RE DOING. The tank has a fitted lid that is very snug; the tape is just added protection. 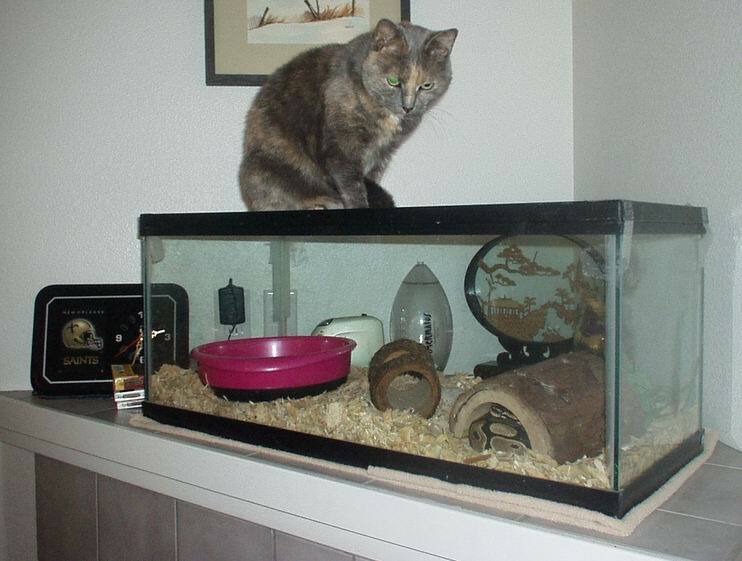 This setup has been effective for months; *I* can't get the lid off with my strength, I do not see how a small snake and a declawed cat will do likewise, no matter the love between them. There are bigger snakes that I deal with all the time who also have this setup, and are fine. It just looks thrown together. 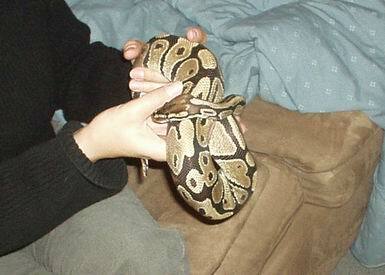 Pythons, as are rule, are not very cuddly. Unless you are a field mouse or housecat (declawed cat = snake buffet). Gary Larson got attacked by his own pet snake before he got rid of it. That's why you see all those funny cartoons involving constrictors. AArdvark wrote: Pythons, as are rule, are not very cuddly. Unless you are a field mouse or housecat (declawed cat = snake buffet). Cuddly? No, but most are gentle and easily handled. They just like to wander up shirtsleeves and behind sofa cushions. Vitriola wrote: They just like to wander up shirtsleeves and behind sofa cushions. And down French Horns. My wife lost one that way once. She discovered it at the stadium several days later. Ick. Hahah, me having a relationship with my father as portrayed above? COMEDY GOLD! Let us now welcome Buju to the family! Cocoa was adopted by a nice, somewhat spaz of a girl that works at a vet clinic, about 24 hours after I decided I wanted her for myself. Here, now, is Buju! As you can see, there is little to, well, absolutely zero difference in the aesthetic value of these animals. However, where Cocoa was nice and sedate and terrified, this one is twitchy and tense and terrified. Still nice, but, like a person who always fidgets around you and stands slightly out of your sight range, a creature that just makes me nervous being around it. I hope someone adopts her soon! But, since I seem to have a setup that overheats snakes and makes them ravenously hungry every second of the day, I will now be taking yet another snake home that has not been eating well lately. Next week, stay tuned for...Frankie!!! So, uh, how many cats you guys down to now? Which is worse for the cat? Chinese restaurant kitchen or Jonsey and V's apartment? Snake infested apartment, I add. AArdvark wrote: So, uh, how many cats you guys down to now? I was assured that this one wasn't sticking around for too long. Ice Cream Jonsey wrote: I was assured that this one wasn't sticking around for too long. Even if she was, I didn't put her in the bedroom or within sight of your monitor, so she could hardly have any effect on your life.